Hope you’re all having a great month so far! It’s been a fun few weeks, with volunteer socials in Port Angeles (WA) and Cape Meares (OR) and trainings in Florence (OR) and Gold Beach (OR). A big thanks to all of you who attended and welcome to our new volunteers. 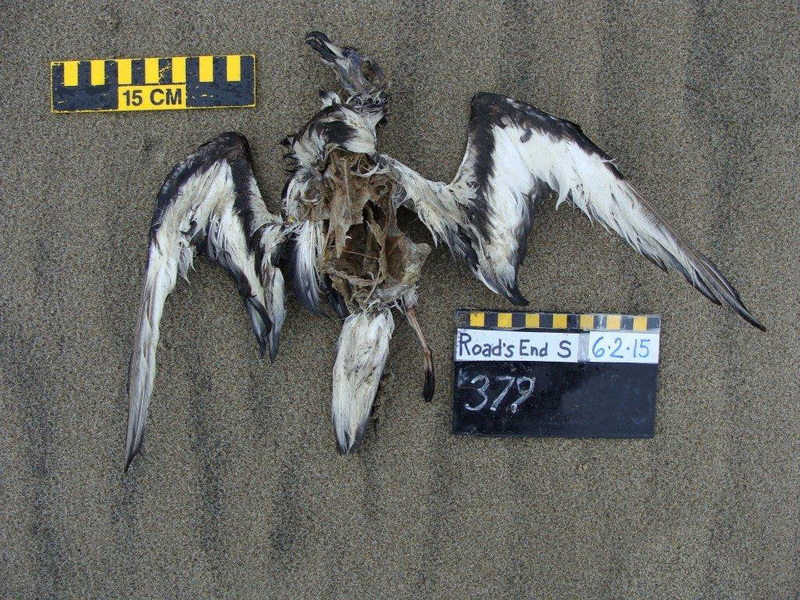 This week Julia is headed to Fort Bragg (CA) to give a community presentation on “The Natural History of Dead Birds.” We’ll also have weekend trainings in Fort Bragg and Fortuna (CA). 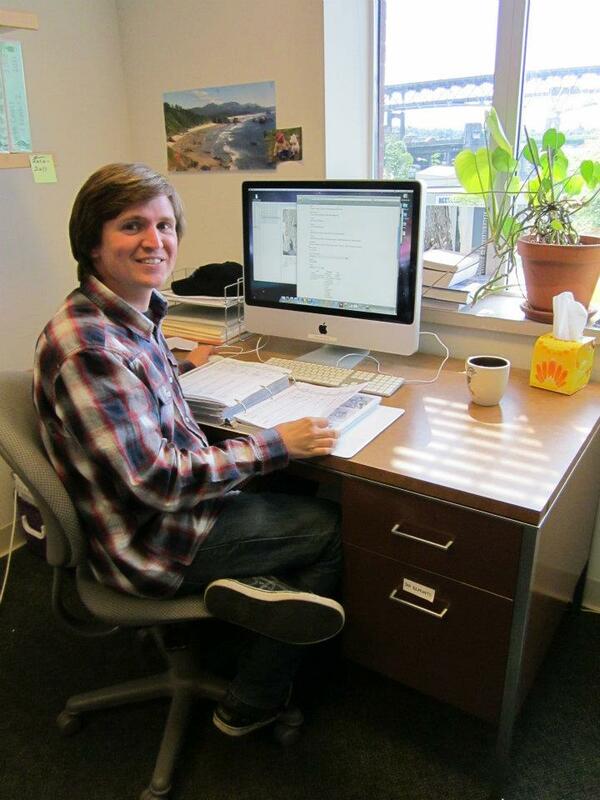 California COASSTers, we hope you can join us! Choose webbed (go to Q2), choose completely webbed (go to Q3), choose 4 toes: 3 webbed, 4th free (go to Q5), choose tarsus less than 12mm across (go to Q6), choose 4th toe lobed, with flap extending to end of nail – WATERFOWL: DIVING DUCKS. On WF1, we’re stuck – need a bill. You can return to the wing key, or look through the WF options that have white in the secondaries: White-winged Scoter (WF5), Greater Scaup (WF15), Bufflehead (WF29), goldeneyes (WF31, WF33) and mergansers (WF35, WF37). 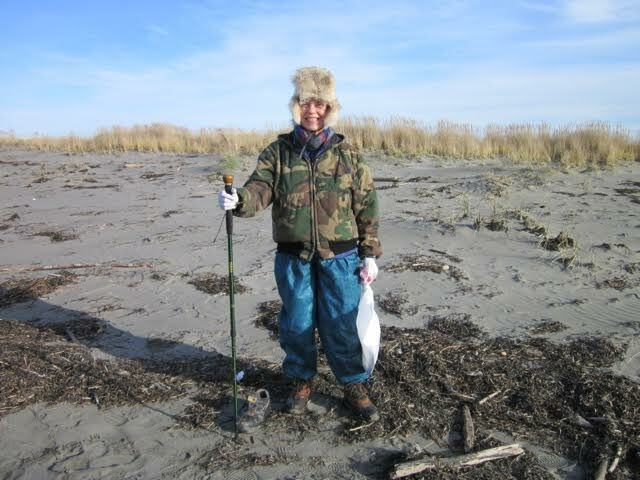 Based on measurements, we can eliminate all these except mergansers and White-winged Scoter. Only one of these has dark plumage on the side of the neck and upper breast: White-winged Scoter. On WF1, we’re stuck – need a bill. 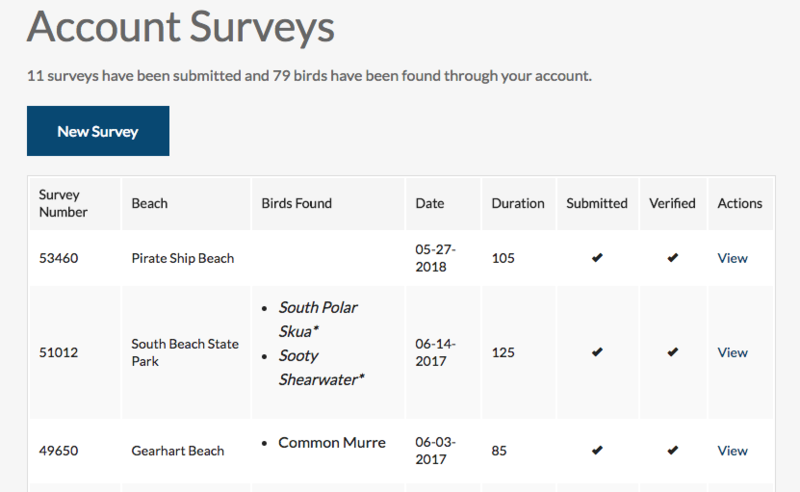 You can return to the wing key/wing table, or look through the WF options that have white in the secondaries: White-winged Scoter (WF3), Greater Scaup (WF13), Bufflehead (WF15). Of these, measurements fit only one: White-winged Scoter. Choose webbed (go to Q2), choose completely webbed (go to Q3), choose 4 toes: 3 webbed, 4th free (go to Q5), choose tarsus not more than 12mm across (go to Q6), choose thin toe or nail only (go to Q7), choose heel flat (go to Q8), choose tarsus less than 65mm – TUBENOSES: PETRELS. On TN1, select wing chord more than 20cm, True Petrels. Bill color is dark, underwing is white, with dark stripe from wrist towards wingpit: Mottled Petrel. 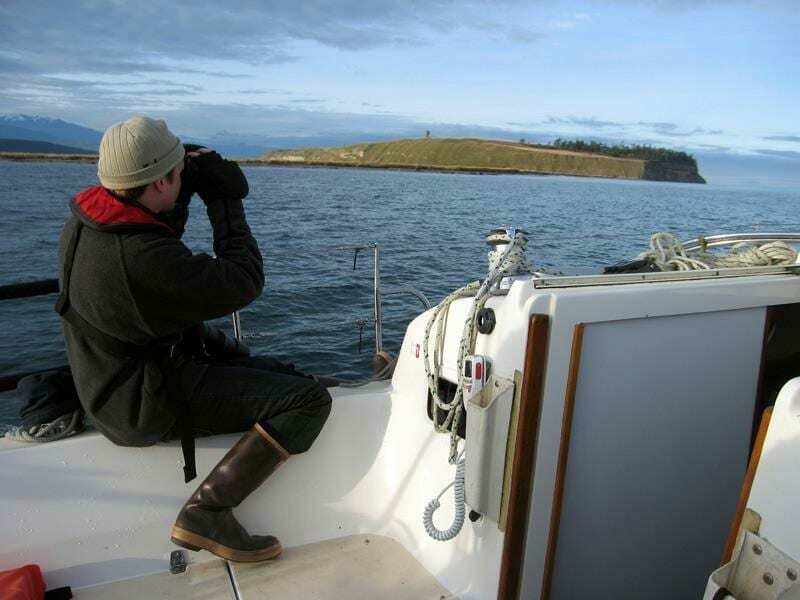 On TN1, select wing chord more than 20cm, True Petrels. Bill is thick and short, bill color is black: Gadfly Petrels (Mottled Petrel is one). The saga of this piece of debris is quite interesting. 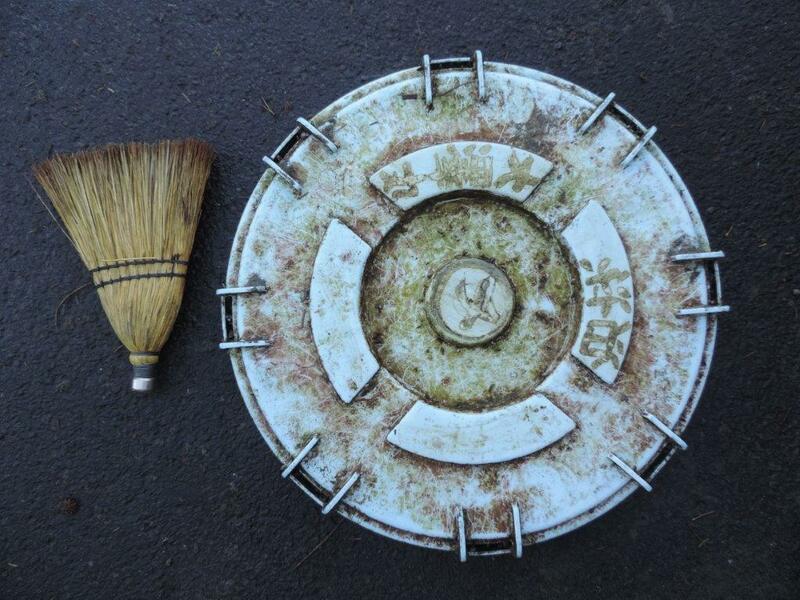 This container lid was found by beach cleaner extraordinaire Russ in Longbeach, WA. One of our COASST students, Devin (or shall we call her Sherlock Holmes), who is fluent in Japanese, saw this photo and recognized 有栄七屋商店 as Kanji (Chinese characters that have been adopted in Japan). She did some sleuthing and discovered the lid is from a local Japanese grocery store (and nailed it down to the address of 5-8 Honcho Otsuchi, Kamihei District, Iwate Prefecture 028-1116 Japan). Along with discovering the source of the lid, Devin found something truly intriguing via Google Street View: the entire location was flattened and washed away by the Tohoku tsunami. The map shows the epicenter of the Tohoku earthquake in red, and the store location that the lid was from in green. 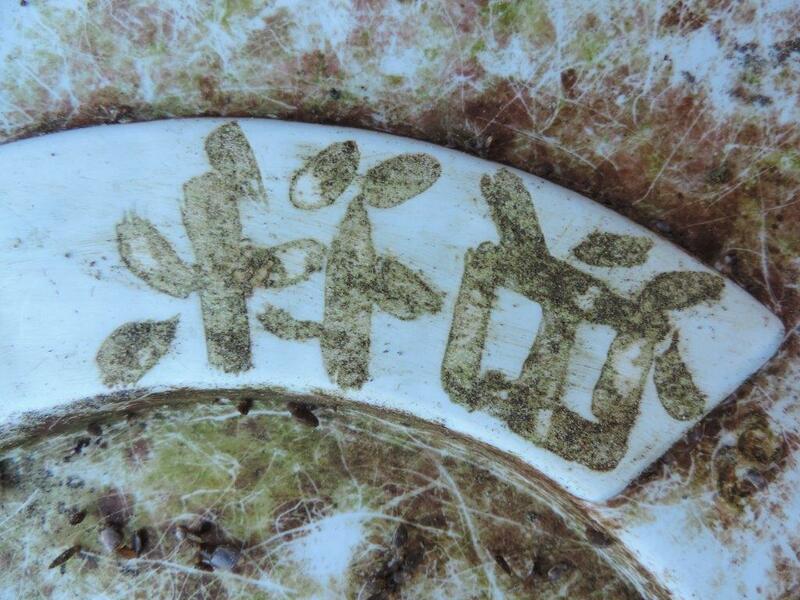 Take a look at what Paul and Louise found at Bishop’s Beach West earlier this year. 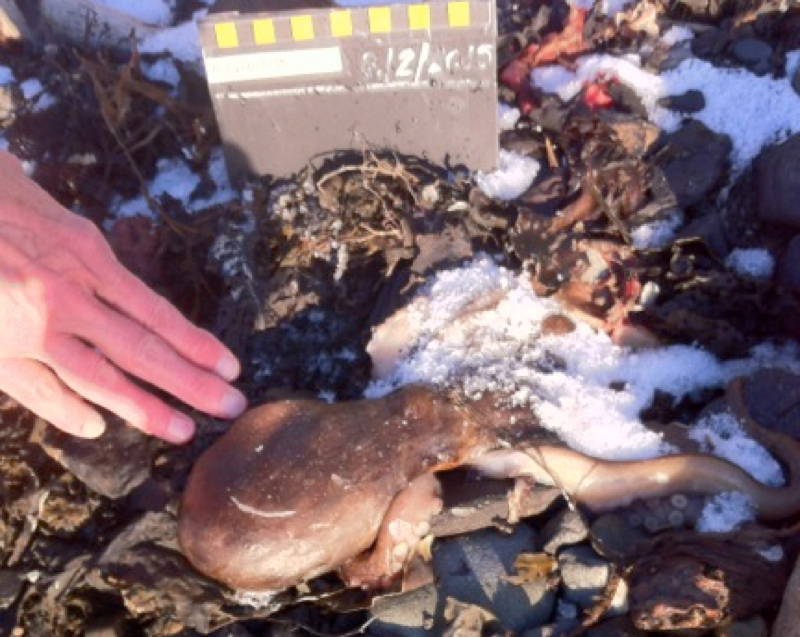 COASST intern Mallory refers to this as an “Octopopsicle” – a Giant Pacific Octopus washed ashore and frozen in the ice. According to NOAA, there are at least seven species of octopus in the Gulf of Alaska, but the Giant Pacific Octopus (Enteroctopus dofleini) is by far the most common. The Giant Pacific Octopus is able to change the color and texture of its skin at will, making it an adept hunter and challenging opponent when playing Hide-and-go-Seek. 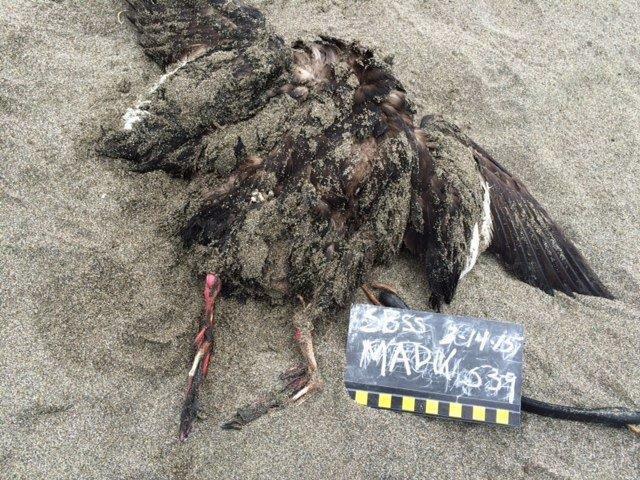 This entry was posted in Uncategorized and tagged beached birds, Marine Debris, octopus, tubenose, Waterfowl on June 15, 2015 by coasst.